Neurotris ION Spray is specially formulated to maximize even distribution of the SX series Specific Frequency Signature (SFS) energy over the full surface of the Sculpting Gloves™. Made with natural Mediterranean Sea Salts, no color, no parabens and no perfume. 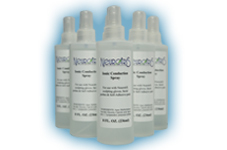 The Neurotris Ion Spray can also be used along with the Neurotris gliding gels to enhance conduction. Use with the SX series machines & the Pico Toner.